Many of the Warivi families are out of the community attending a funeral in a nearby village. 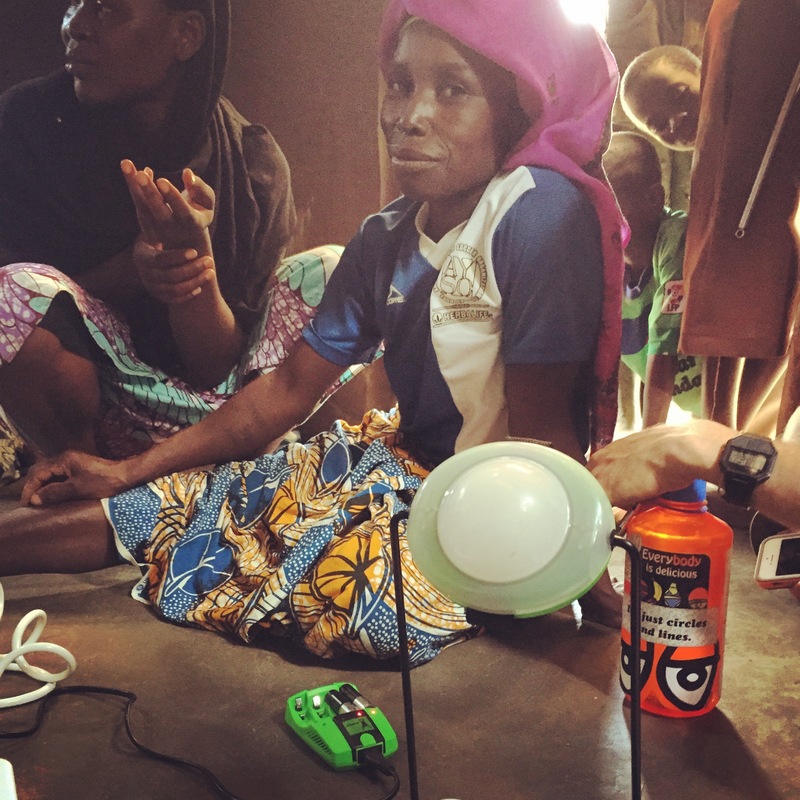 But we are two days into monitoring and have reached 41 of our 48 households. In between household visits we’ve had many opportunities to play with the kids and talk to them about clean water. 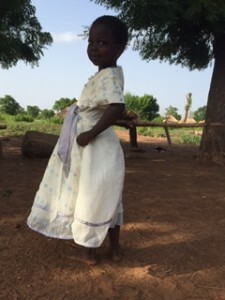 Zeinab, the granddaughter of the Warivi chief and affectionately known as Queen Z, is the leader of the pack. Along with the other children of the village, Queen Z accompanies us on our household visits where we check in with the families about the use of their Safe Storage Containers (SSC). 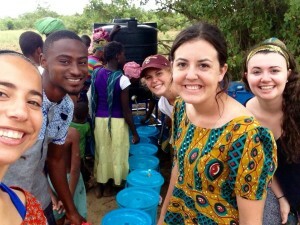 We ask about the last time they refilled their SSC, the taste of the water and the business hours of the water center. 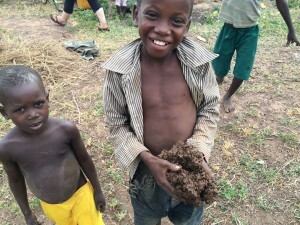 We ask whether or not they continue to use dug out water, reinforce the benefits of clean water, and inquiry about any problems they might have. 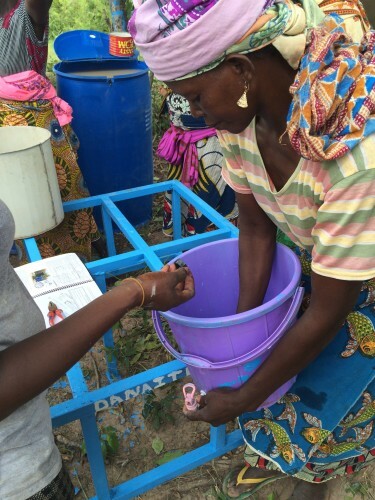 The women and men of the households share stories from the difference in taste of their teas with the clean water to their vows to only drink clean water–all highlights of our household visits. We say our “M bos” (That’s great!) and our Tipayas (Thank you) and give out a clean water bottle for the household. 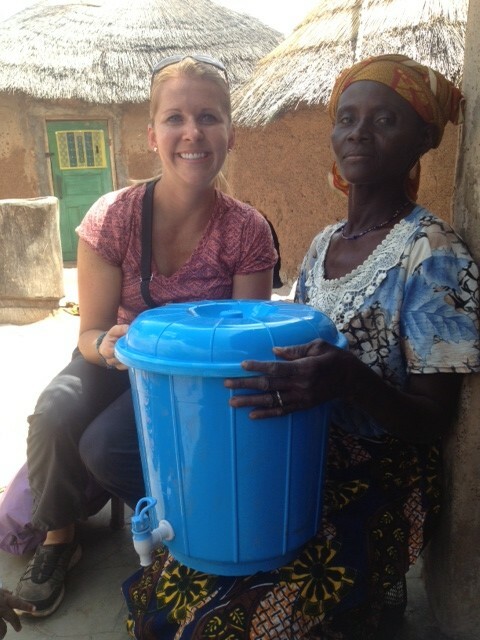 The business ladies are proud of their center and it is always a joy to hear them talk of their sales and share news that people from nearby villages (who are in the process of moving their own water center) are buying clean water from them. 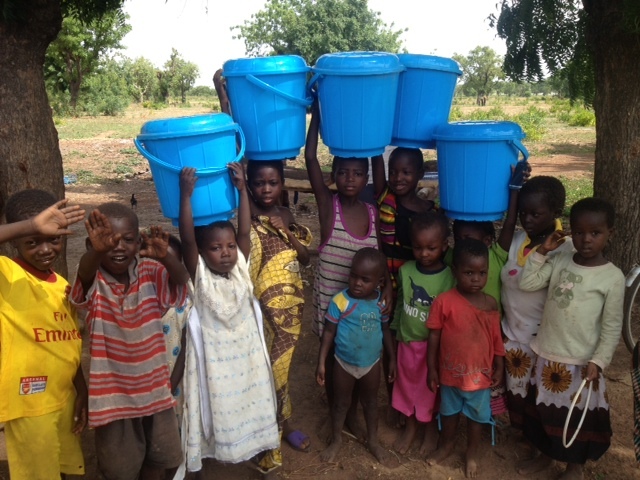 They are grateful that they can provide this service to their communities and it shows in their dedication to the water center! 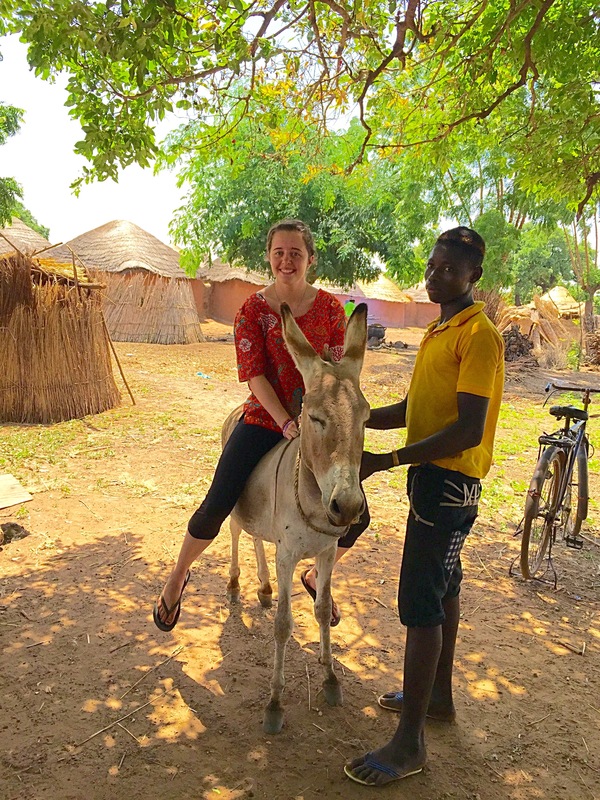 Several years ago, you didn’t have to travel too far outside of Tamale to find a community without access to clean drinking water or electricity. Now, thanks to the work of previous Saha fellows, we are going further and further outside of the town center to find new communities to work with. 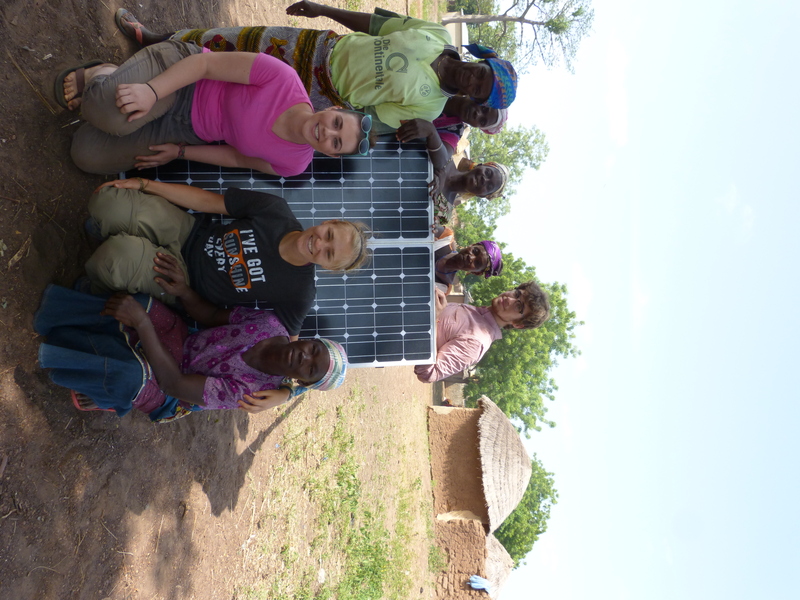 As a newer project, there are nearby opportunities for solar implementation. Even so, Belampuso (formerly known as Balamposo!) 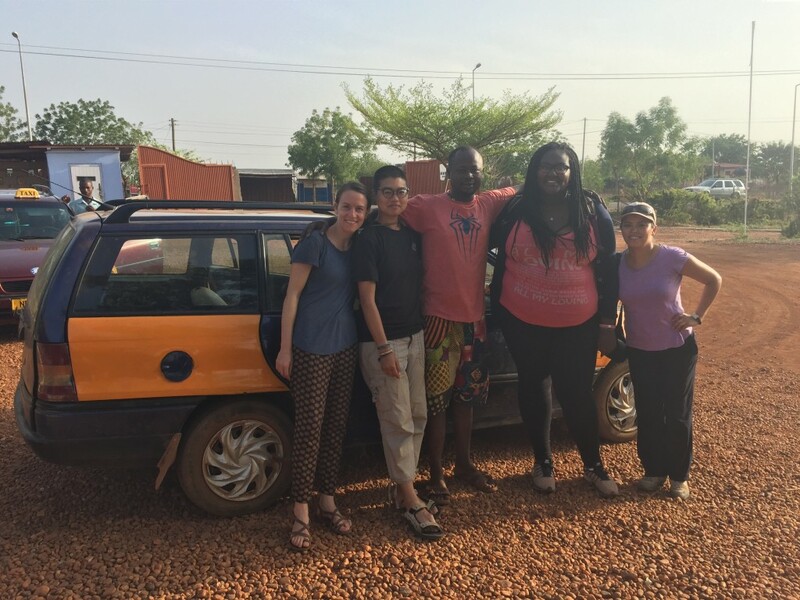 is about an hour away by car, so our team spends a lot of time in the cab to and from GILLBT guest house, our home base in Tamale. 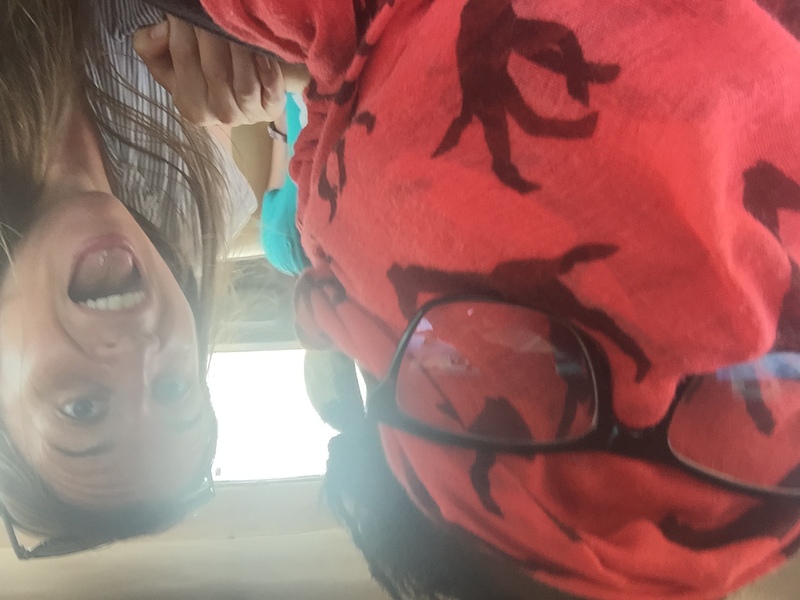 Tejani (affectionately known as TJ or Teej) is at once translator, taxi driver, and friend. He usually arrives early, making fun of us, delayed as always, as we rush to gather our things and scarf down a carb-heavy breakfast. Recently, as we have entered the more rigorous building and training portions of our project, and out of consideration for the members of our communities who are fasting for Ramadan, we have been leaving at 5:30am! Some mornings, when we aren’t falling back to sleep against the backseat cushions, we use the ride out to Belampuso to make final preparations for the day ahead, comparing notes and rehearsing prepared remarks for a community meeting or a training session or a monitoring routine. On the way home we reflect on the work that we did, or the interactions we had, and ways that we can improve the next day. Some afternoons we are quiet, looking out the window as Ghana unfolds around us. We have made the same round trip each day for more than two weeks now, but the beauty of this country and its people still amazes us. The drive to and from Belampuso is also a great time to get to know our team better. We are a very diverse group, with our own interests, backgrounds, and origins. We come from different schools and jobs, each bringing something unique to a project that requires a variety of skills and perspectives. Mekleet’s family is from Ethiopia. Phoebe’s family is from Hong Kong. 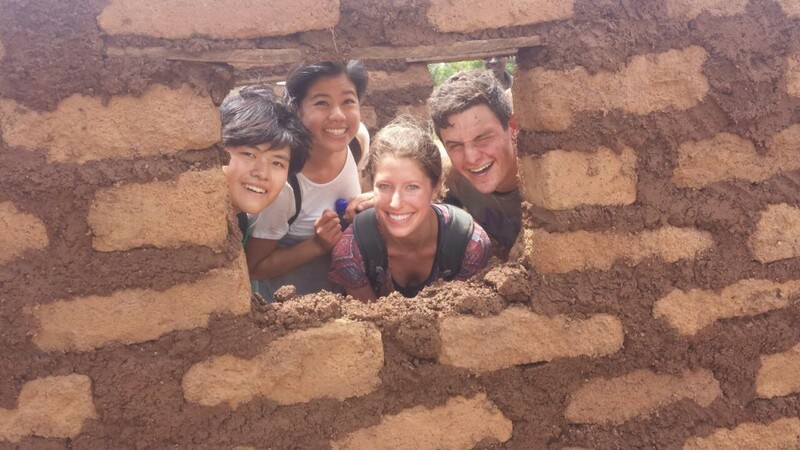 Jessica is from Peru, while Britt hails from Boston and TJ from just outside Tamale. We have not yet met TJ’s mother, the famous baker of the soft fresh bread that, on the days we are lucky, greets us from the dashboard as TJ rolls into the parking lot. 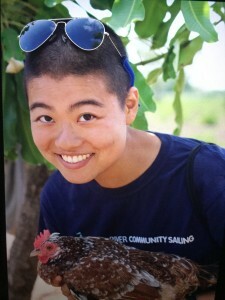 But we have met his cat, and a chicken with a new flock of chicks following behind her. 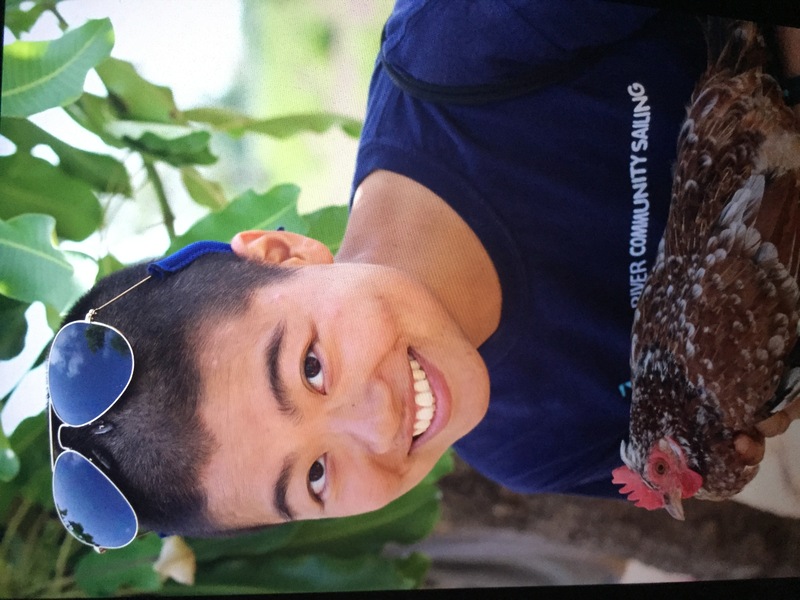 Just this past week, one of the Fulani (nomadic cattle herders living on the outskirts of town, known for their milk and cheese) gave us a live chicken who we affectionately named Wagashi (the fried Fulani cheese we have grown so fond of!). Anticipating some push back if we tried to reserve a room for our new friend at GILLBT, TJ took it home with him. That day we were 6 driving back from Belampuso! In the car, we all have our idiosyncrasies. 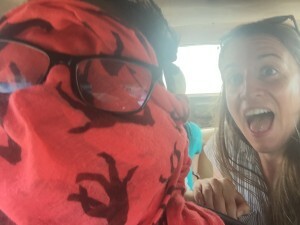 Mekleet rides in the front where most of the dirt from the road whips up through the open window, so she has started wrapping her scarf around her face and securing her glasses over her pink nose, patterned eyes peeking out through the frames. It may seem like she can’t see, but she can, so beware of taking discrete selfies! Jessica can sleep anywhere, and the rocking of the moving car immediately lulls her to sleep as we make our way to and from town. Phoebe wears her safari style wide brimmed hat, despite the shade of the roof as she jots down project related notes. Britt gazes out the window, camera in hand, poised for the next kodak moment, of which there are too many to count. And TJ bobs his head and sings along to the music emanating from his cell phone, perched on the dash. The phone only holds two songs, but we have learned that he has many more favorites, and that he was in a band growing up. He promises to write a Saha rap before our time in Tamale is through! Monday afternoon, after a full day of distributing lanterns in anticipation of our opening night, we drove away from Belampuso, waving to the children who have gathered to say goodbye. “Tinya Taba” we call, and also, “Nawumni Labsena,” Britt throws in. The men laugh and wave. We think they are impressed by our Dagbani, but later Britt learns that she has said, “God grant you safe travels” which of course makes no sense when we are the ones heading out of town. Oh well. They laugh when we attempt the right greetings too! A few minutes on the road and we run into a road block. Most days it is the Police stopping to ask us what our business is, but this day it is a full herd of cattle! We stop and get out to examine them up close before TJ informs us that they do in fact charge without warning. Back in the car we go. 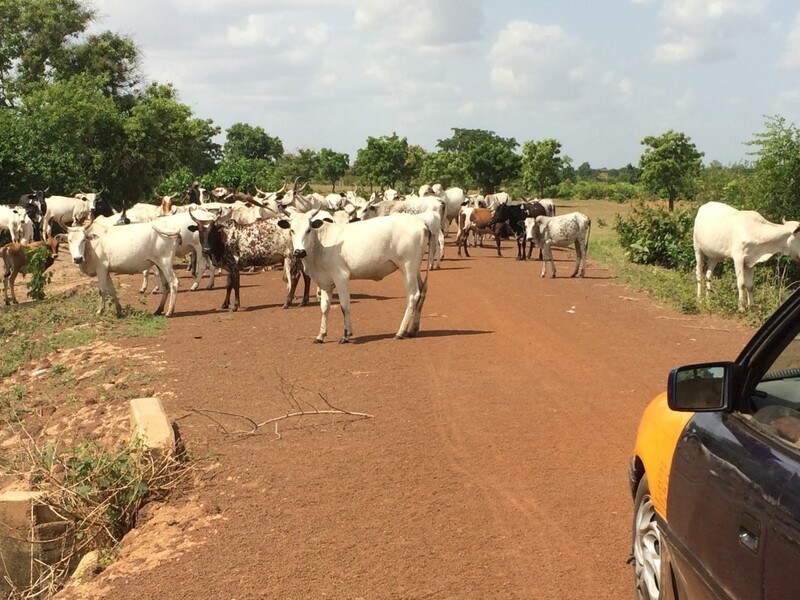 As the cows part and we make our way through we see several Fulani, sticks in hand, ushering the beasts to the side of the road. TJ yells something to the men. We have grown accustomed to what sounds like anger, but is often light hearted banter between drivers and pedestrians on the road in Ghana. 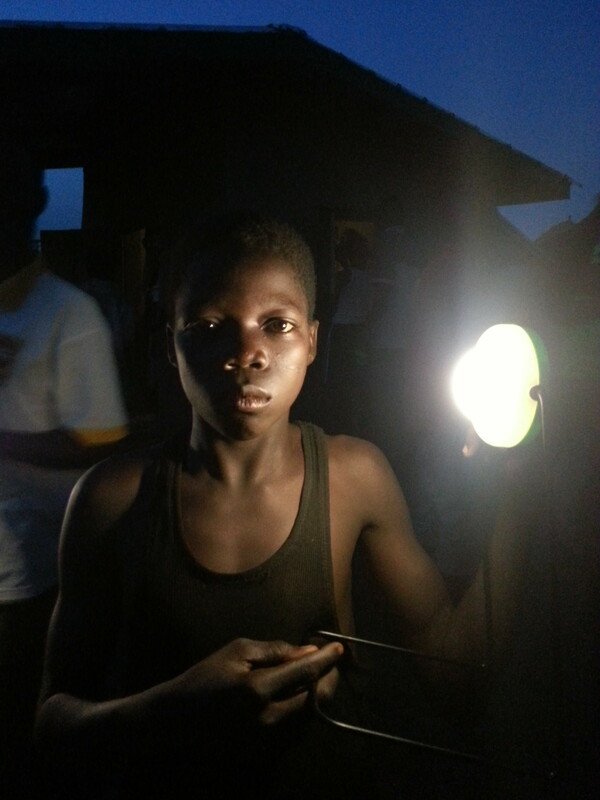 Tuesday night was the opening night of Belampuso’s solar charging center and as such we made our way home in the dark. The faint glow of the moon and the light from our highbeams guide our way through absolute darkness. We drive in silence, each gazing out through the windows as lights turn on for the first in Belampuso. Usually, we keep the windows open, welcoming the breeze into the sun baked cab, even though the wind brings with it clay colored gusts of dust from the dirt road, coating everything in a layer of red. By the time we arrive back at GILLBT, often as much as 10 hours after we left, we are tired but satisfied, dirt clinging to the sweat on our brows, a new surge of energy carrying us quickly to the filtered water tanks and then to the welcoming cool of a cleansing shower. Just two days ago we were thrown a curveball when our women entrepreneurs, Abiba and Amina, requested that we move our opening day from Monday to Sunday. Team Wahab collectively decided that we were up to the challenge! 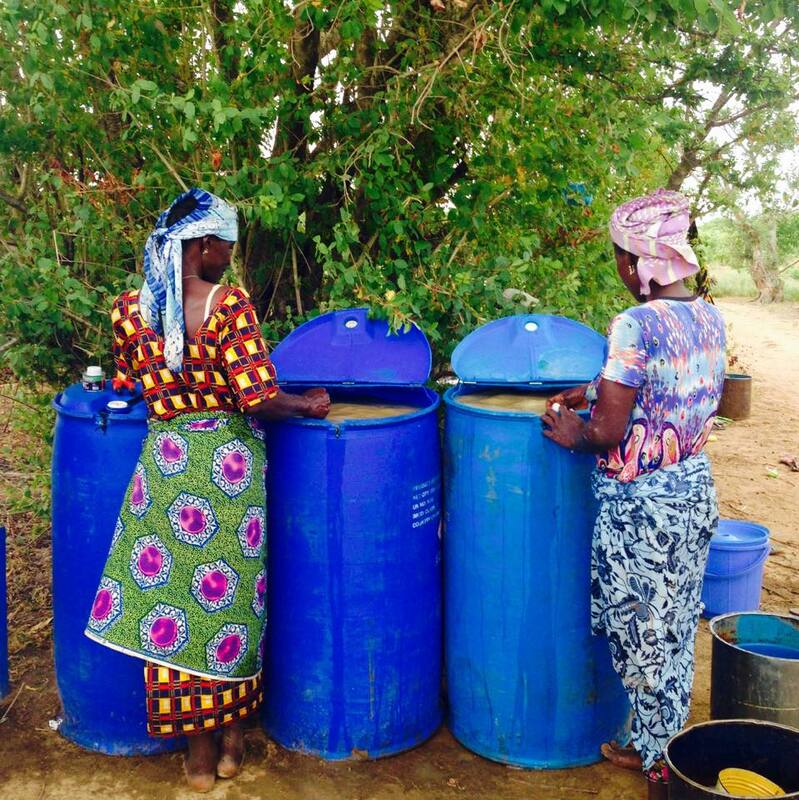 After two long, hot days of distributing Safe Storage Containers to all 54 families in our community, and working with our women entrepreneurs to fill a whole polytank with clean water, we were ready for opening day. While Wahab, our translator, made a last minute fix on one of the three blue drums, Kelly and Kelsey pumped up the mood with an impromptu dance party. Since the discovery that jump-rope in Dagbani, the local language, is “Tsamina mina”, “Waka Waka (This Time For Africa)” by Shakira has become our team jam. 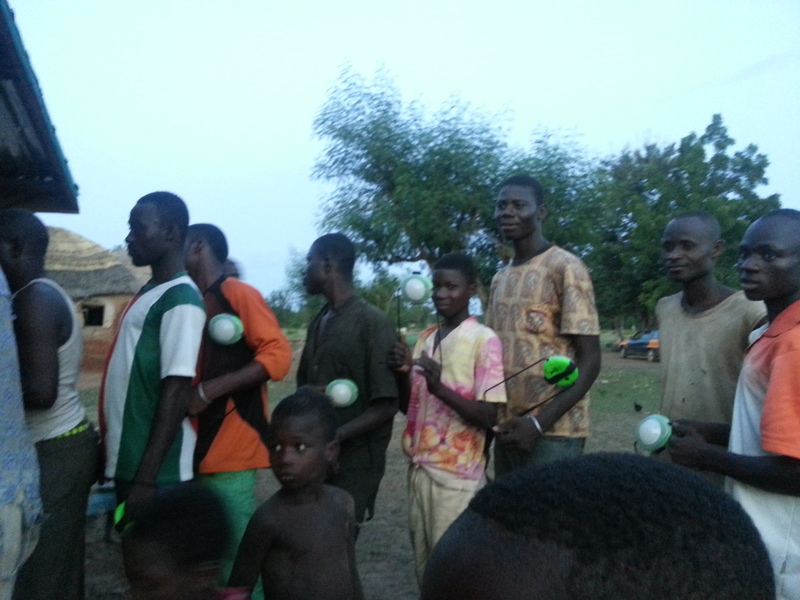 The kids in our community are also very familiar with the song and often sing along with us. It’s amazing that Shakira has been able to transcend language barriers and help us build relationships with the kids in our community All the while, women were starting to arrive with their Safe Storage Containers, excited to provide their families with their first supply of clean water. Amina and Abiba were treated as celebrities upon arrival; and so the wild rumpus began! In efforts to stay organized amidst this wild crowd, Jessie marked off containers on the household list, Bria labeled containers— since our Sharpie from yesterday turned out to be a dry-erase marker—Kelly and Kelsey rationed soap, and Wahab checked for leaky buckets. 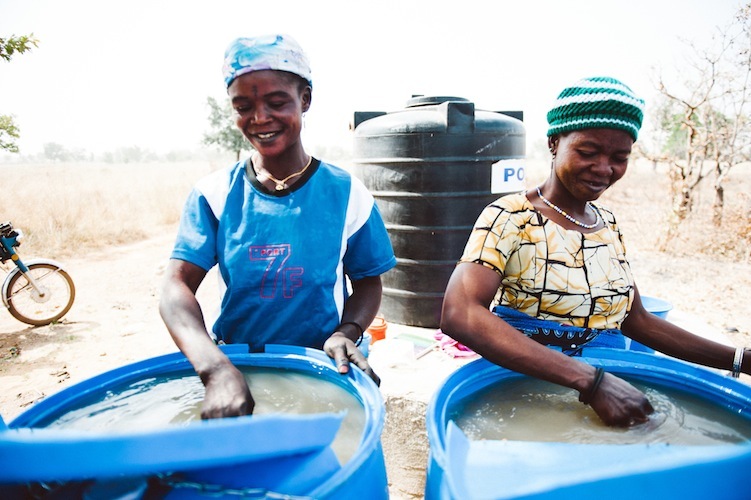 Our super-star women entrepreneurs collected money and put smiles on the faces of all their friends with their newly treated, safe drinking-water! 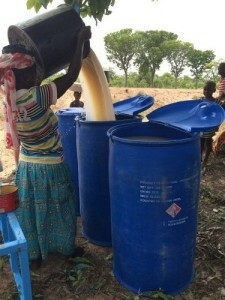 Over 40 households sent a representative to fetch polytank water! Our only bump in the road was when we ran out of water in the polytank. Unfortunately, last night’s alum treatment was a little too conservative— if you use too much alum, it can affect the taste of the water— so a quick refill was not in the cards. 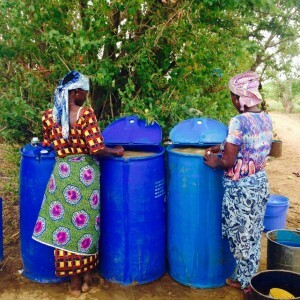 Amina and Abiba optimistically retreated the dugout water in the blue drums, announcing to the few remaining customers that they would re-open for business in the evening. As it turns out, because most of the community is fasting for Ramadan, they can’t actually drink water until sundown. Everyone will have delicious drinking-water in no time! When asked about their plans for business hours later in the week, Amina and Abiba did not have to discuss their schedules. Instead, they excitedly announced that they hope to open for business everyday! Today Team Nestor hits up the blog with details in building the solar charging center and their time in the community of Vohyili. 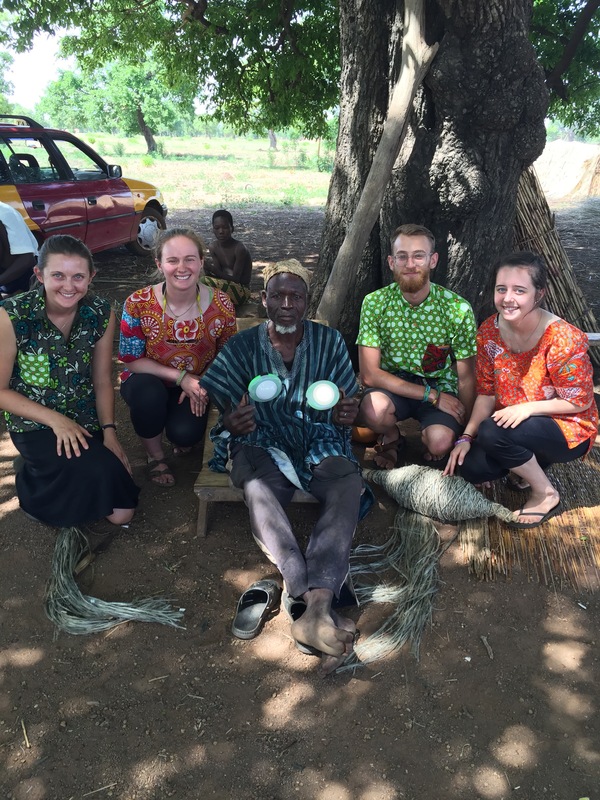 We have now spent a long and rewarding 11 days in Ghana. 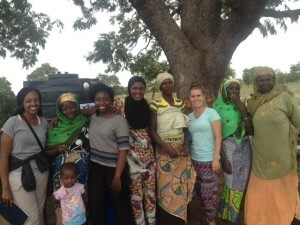 Our journey began with a gust of hot, humid air as we unloaded the plane and got our first taste of Ghana. Once we all had arrived safely in Accra, the team of 40 Saha field reps boarded a bus and drove on a meandering two-lane road primarily made of uneven cement with the occasional stretch of dirt and ditches. The ride took us from the southern capitol city of Accra to Kumasi (the 2nd largest city) for a lunch break and then to our final destination, the northern city of Tamale. This was the only “highway” connecting these 3 major cities, so it was a very popular route. We passed through cities, villages, and expansive forests. Many of the communities seemed to be centered around this main road – using it as a way to attract outside customers. In each town, people watched and sometimes waved to our bus as we rolled through the middle of their marketplace. Ghana lies 6 degrees latitude north of the equator, so the sun sets punctually at 6:30pm all year round. The view from the bus window shifted from vibrant, bustling markets to dark, quiet shacks lit only by a couple flashlights. 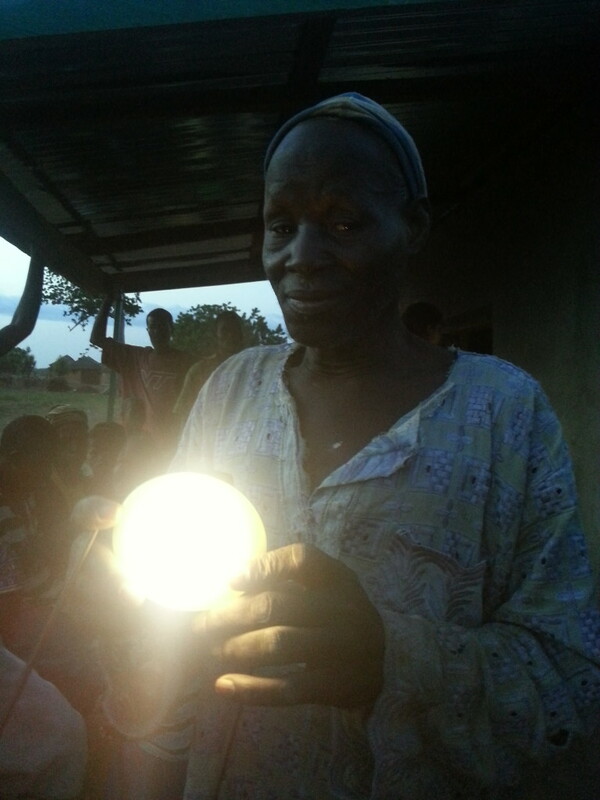 Many rural villages are not electrified and people must rely on generators and batteries. Even in electrified cities, energy is expensive. 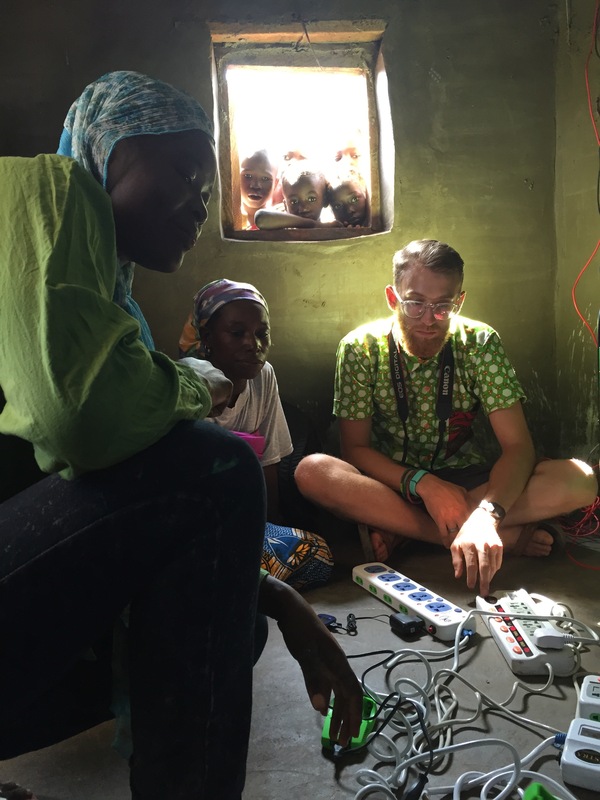 Tamale is the fastest growing city in the region of Northern Ghana and its increasing population leads to a higher demand for electricity. 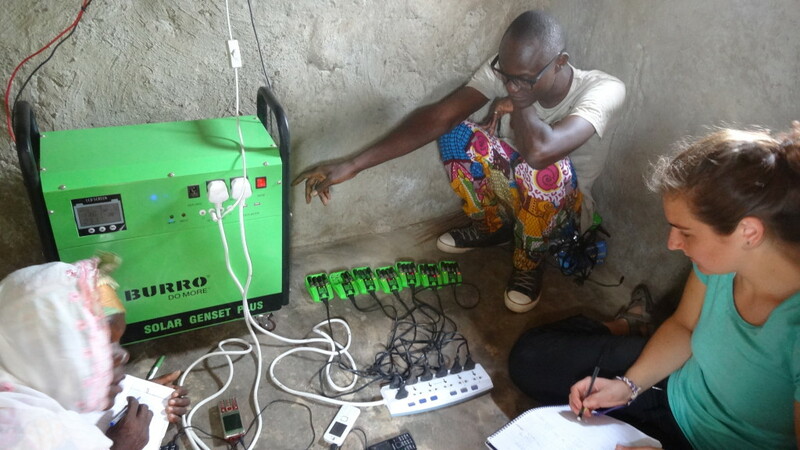 Drive just 15 minutes outside of Tamale’s urban landscape and it becomes apparent that electricity and basic resources are beyond the purchasing power of families in rural villages. 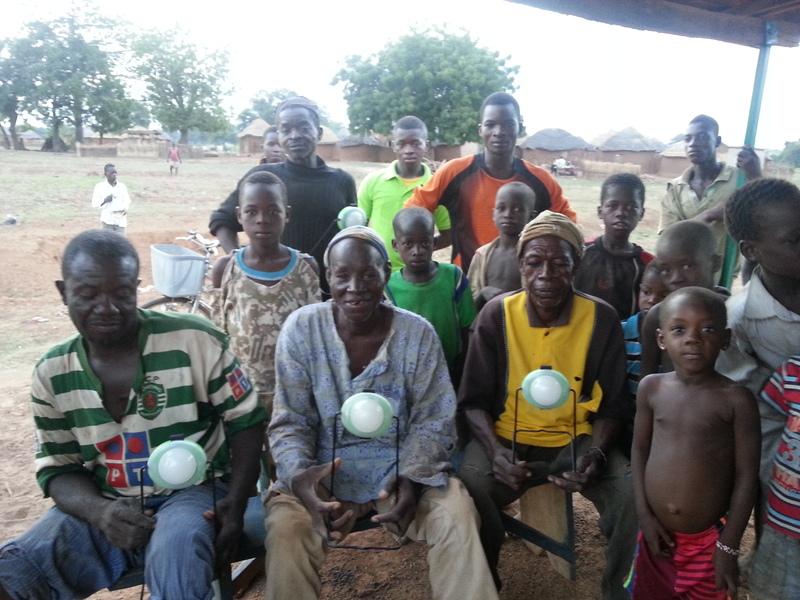 The Dagomba people have established a way of life based around a closed loop resource system. The mortar used for all buildings is mixed together in a pit with clay-laden soil and water carried from a dugout a mile away. 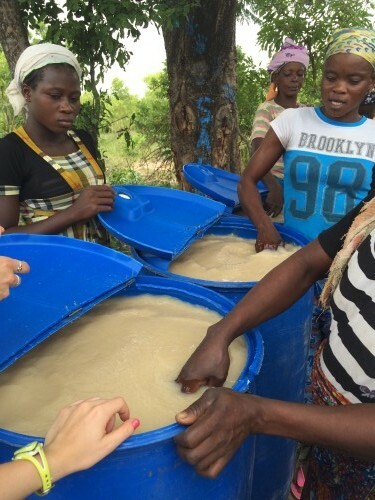 The villagers stomp the mix with their feet, carefully adding water until the perfect consistency is reached. Mortar is used not only to secure layers of bricks, but is added as a coating around the entire structure with a throwing technique requiring grace so as not to splatter others around you, but ensure the mortar stays firm to the wall. 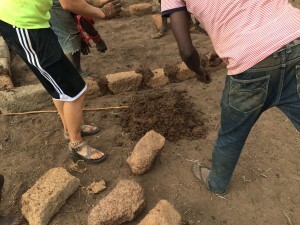 The mortar and brick is then left to dry for a day. 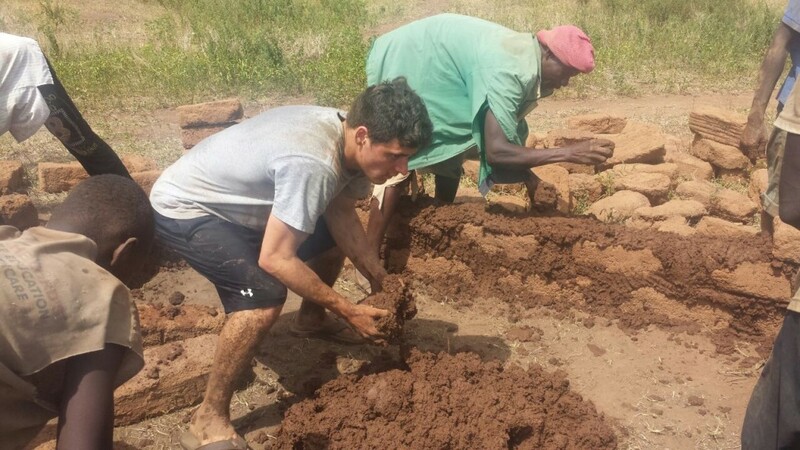 After this, fine sand is sifted and mixed with cement and water to create a smooth plaster bolstering the hut walls. These processes were basic community knowledge and everyone had a role to play in the hut construction. 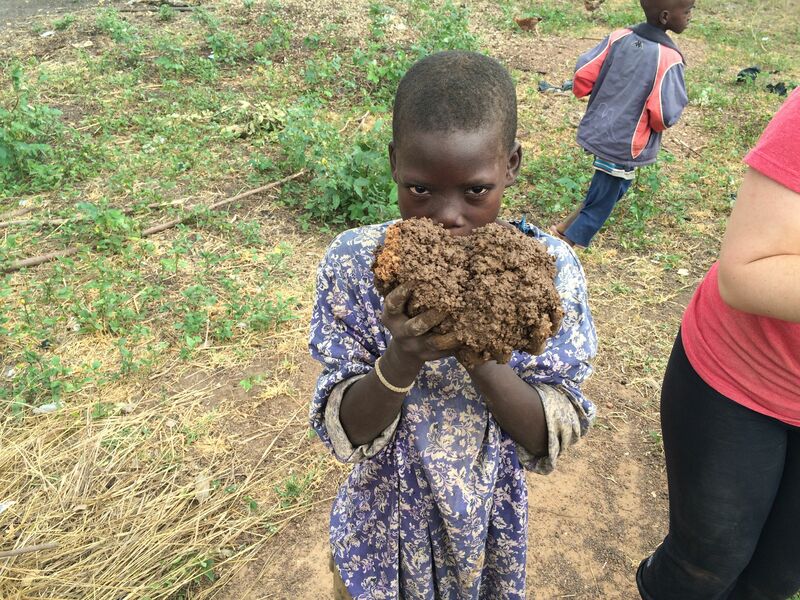 After 3 days of enthusiastically joining the village in this process by carrying blocks on our heads, accidentally getting mortar in our eyes, and marching knee-deep in mud (to mix the mortar), we could never look at a mud hut the same way again. 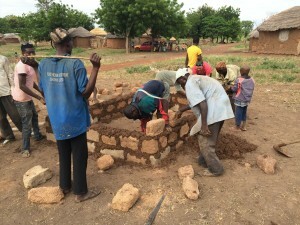 As Americans, it is easy to see the mud hut as an icon of the “African village.” But it is much more challenging to convey its underlying complex processes and beautifully simple design. 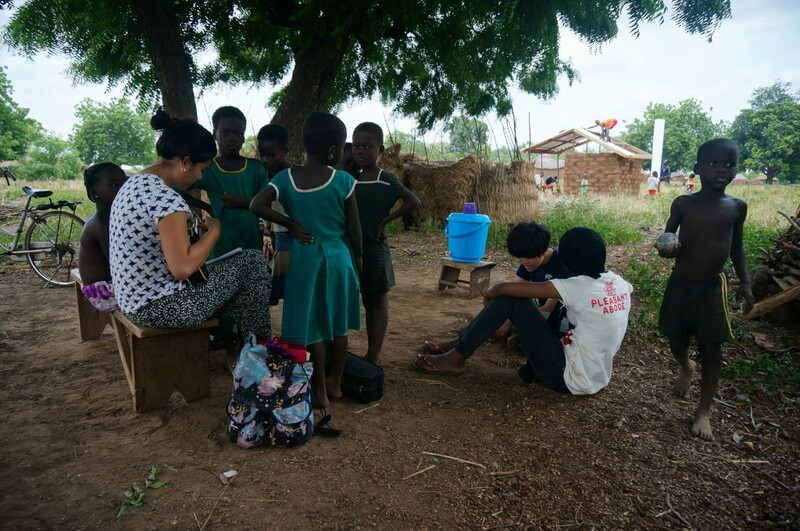 Someone asked us if we built our own homes in America and we had to admit that we knew far more about the homes of Ghanaian villagers than our own. 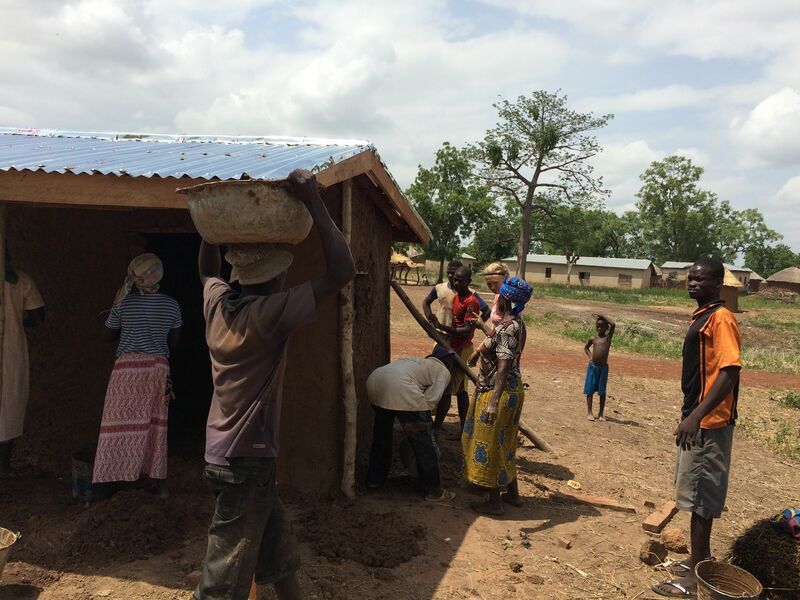 It dawned on us that we sincerely wished we had constructed our own homes out of local materials with the help of our entire community. 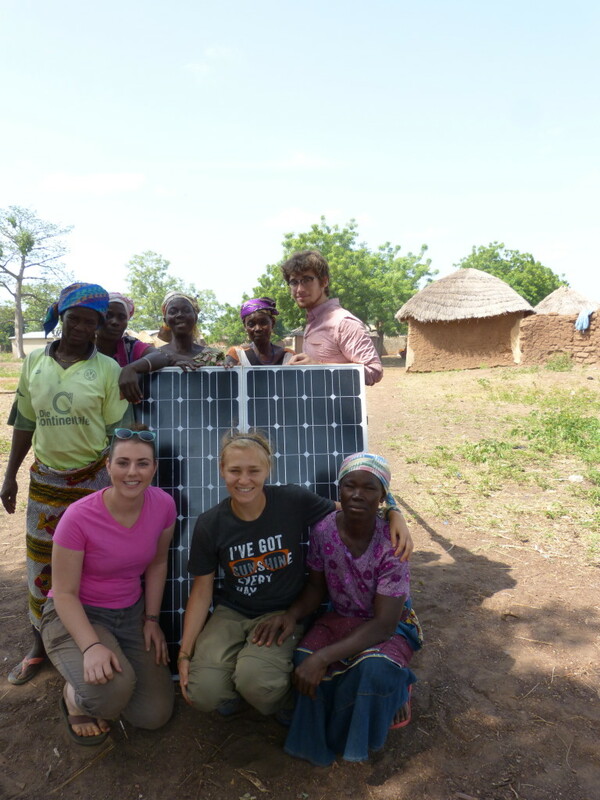 The efficiency with which the community members of Vogyili used their available resources amazed and humbled us. 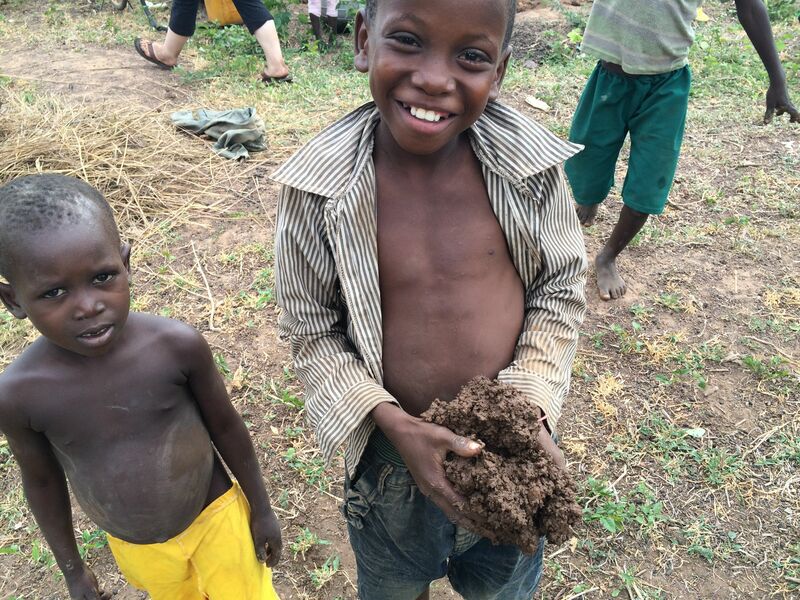 Through the process of constructing a mud hut, we ended up deconstructing our own perception of rural Ghanaian life. 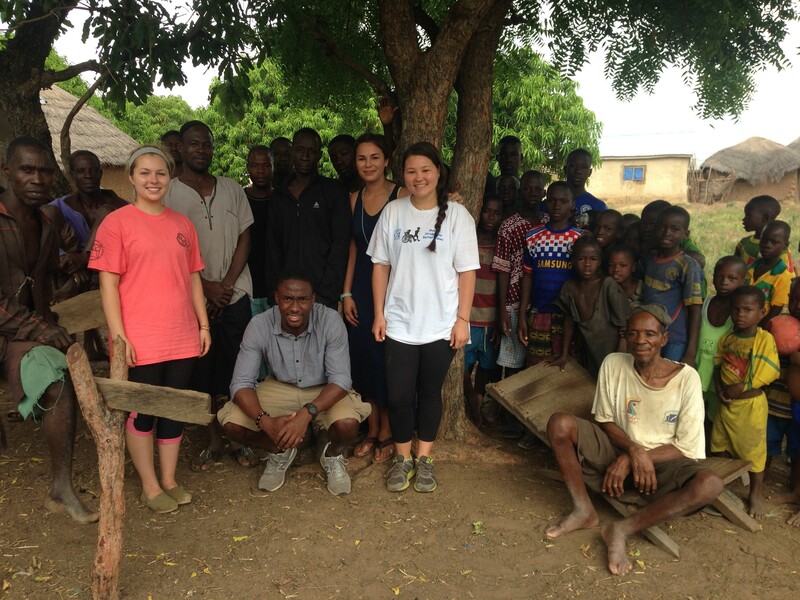 Hi from Team Simply in Ghana! We have the privilege of implementing a clean water business in the village of Bamvim. Yesterday, we met with our community members and picked a spot near the dugout to put the Polytank stand, where the clean water center will be established. Together with the community, we painted the stand so that it would not rust. Unfortunately, our paint leaked all over the bag with all of our tools inside, so everything was covered in blue paint. We only had two paint brushes, so we had to think on our feet a little bit and ended up painting with our hands. It was definitely a messy but fun morning, and an awesome experience to share with the community members. One of the village elders loved the end result so much that he wanted us to come back and paint the door to his home. In order to clear the area for the stand, some of the men worked to cut away some of the surrounding brush. Obviously, we were very thankful for their help. Today was Day 1 of training the women who will run the water business. We went over how to use alum (the coagulant that makes particles in the water sink to the bottom so that the water becomes clear), but they already knew how, so it was a pretty straightforward process. 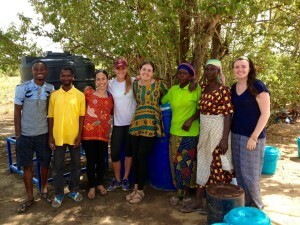 We also went over how to assemble the safe storage containers that will hold the clean water for each household. The women are very smart and eager to learn, so they learned quickly. Outside of the three women who will run the business, many community members came to watch the process, including children and elders. Everyone is so excited, which is awesome 🙂 The day was long, but it didn’t feel like work at all. We had so much fun bonding and collaborating with the women and with the community members. 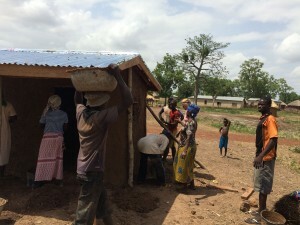 Everyone applauded after each woman successfully assembled a safe storage container; there was a lot of encouragement and empowerment between the women. Today generated a lot of excitement as the idea of the clean water business comes to life. We purchased the rest of our materials today, and will put the center together tomorrow. The community of Bamvim, along with ourselves, plan to open the business on Monday, June 22nd! 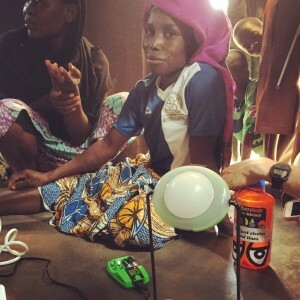 Days like these highlight Saha Global’s ideals of community engagement, women empowerment, and sustainable business opportunities, and we are so excited to be a part of it all. Orientation is completed and our 4 water teams and 7 solar teams are beginning the work of building their new businesses! We will feature stories and pictures from all 11 teams as our program continues. Kicking off our tradition of “Voices from the Field” is Team Amin. 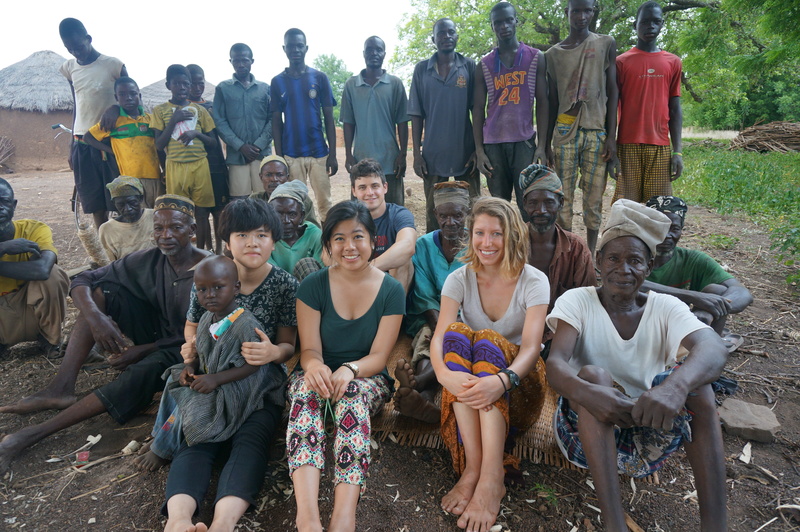 Today our group, comprised of Sasha, Sarah, Tara, Richard and our translator Amin, made our way out to Komlan-yili to pitch the Saha Global business model for community water filtration. After picking up our water supplies from the office we made our way out to the rural community. An hour and a half of dirt, potholed-roads later we arrived. We immediately made our way to the water source, which was predetermined as a stream nearby. After driving to the stream, it was clear the stream had dried up considerably. The seasonal change in location had forced the community members to walk farther and farther to get dirtier stream water. After walking along the dried banks we made our way to the current filling location, passing multiple women who were carrying water along the way. Without even touching the water it was clear how turbid and contaminated the stream was. While briefly talking to a group who was fetching water, we collected our sample and proceeded to make our way back to the community. Upon returning to Komlan-yili, we drove into the heart of the community to speak with a community member. With the help of Amin, we requested a meeting with the community chief and were told to have a seat under a prominent tree among other community members while someone ran to go get him. In a short moment, a wooden reclining chair had been set in front of us and two elders took their place directly across from us. After exchanging pleasantries, the chief proceeded to ask the purpose of our visit (whether we had come to see him or were being chased and wound up there). Here we began to explain how we suspected their water source was contaminated. We asked questions about the quality of water and if it made them sick, especially probing about diarrhea. When the elders and the community members confirmed our suspicion, we proceeded to explain how we, Saha, could provide their community with clean water using a four-step process. 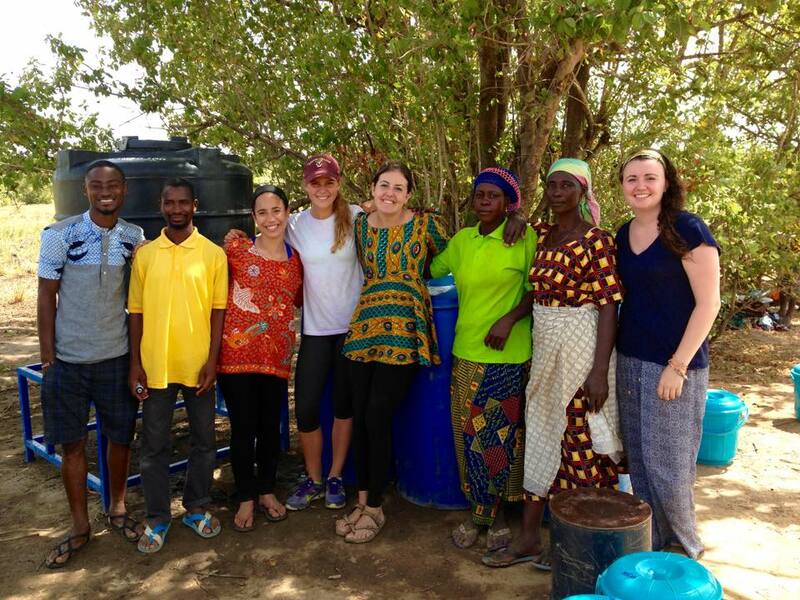 These steps were the following: 1) building a center to house the water, 2) training women entrepreneurs to filter the water and run the business, 3) distribute safe storage containers to each household, and 4) opening and maintaining the businesses after we leave. 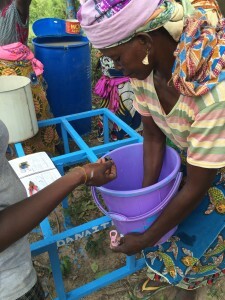 Women collect water from Komlanyili’s stream. Beyond this explanation we concluded that Saha does not pay the women at all and simply helps set up the business. After initial implementation, we explained, it is up to the women entrepreneurs and the community to maintain the business and ensure its success. With this final note, we asked if the elder had any questions and were told that they were very grateful to have us visit and were excited to begin work with us. Exchanging thank you’s and pleasantries once again, we set a time for a community-wide meeting the next day before giving the elder an offering of kola nuts. With much excitement, they exclaimed that they were the ones who were supposed to give us an offering and proceeded to give us eggs as a gift. With much gratitude, we accepted and took our leave to regroup back at our lodging.